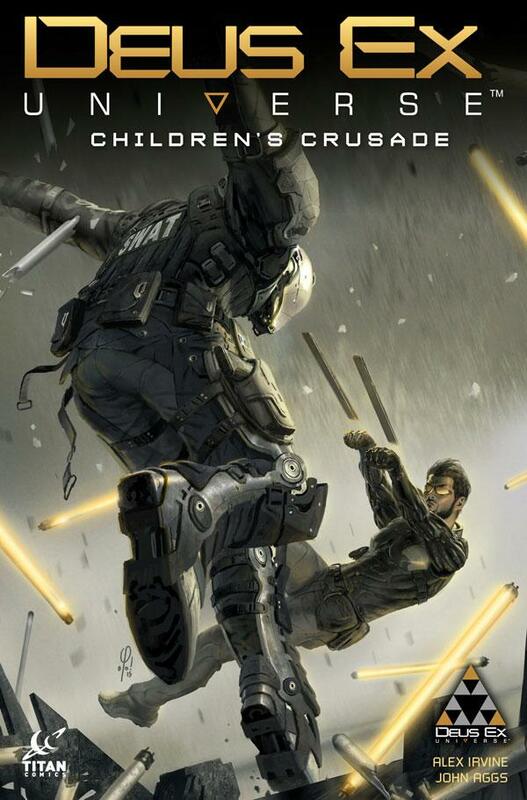 The Fellowship was fortunate enough to obtain a copy of DEUS EX: CHILDREN’S CRUSADE #1 from Titan Comics. Alex Irvine writes, John Aggs draws, Mat Lopes colors, and Rob Steen letters. Pro-Aug terrorists are kidnaping children, and Task Force 29 is being sent in to rescue the kids. Jensen is the new guy, and the team hasn’t gotten used to having an Aug on the team yet. But Jensen is pretty good in a fight, and quickly earns points with the soldiers. When they get control of the scene, things start to get weird, and then they realize that one of the kids has been rigged as a bomb. Jensen’s a pretty quiet guy, but his narration is confident but down-to-earth. And the kidnapped kids are all either government kids or Augs (Aug is short for augmented – cyborgs). Military SF is fun because it gives you the military structure while still letting you run wild with the sci-fi. This is an interesting military story, and it’s a cool cyborg story too. And the art really pulls off the action beautifully. This is the next in a line of cool Deus Ex based comics, and it’s definitely one to check out. Put this one on your pull list. DEUS EX: CHILDREN’S CRUSADE #1 is available now at your FLCS or at titan-comics.com.